Flora Bites is a delicious, chewable probiotic formula for children, designed to promote healthy gut microflora, protect intestinal integrity and support immune function. The gastrointestinal (GI) tract is a finely balanced environment where roughly 500 different strains of bacteria compete for space and nutrients. The natural microflora balance can be disrupted by medications, such as antibiotics, or poor dietary intake. One of the key benefits of probiotics is their ability to increase populations of healthy bacteria in the face of microflora imbalance. In addition, extensive research has identified other broad health benefits, including supporting healthy bowel function, increasing the production of important short-chain fatty acids, which provide energy to the cells of the intestinal lining, boosting immune function, aiding in the digestion of difficult-to-break-down compounds like lactose and casein, and enhancing detoxification of harmful compounds. Flora Bites is a delicious, chewable probiotic formula for children, designed to promote healthy gut microflora, protect intestinal integrity and support immune function. Each creamy, natural orange-flavored cube contains a 5 billion CFU blend of Lactobacillus acidophilus and Bifidobacterium lactis, as well as 20 mg of vitamin C for comprehensive digestive and immune system support. 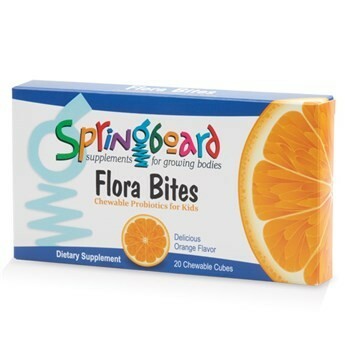 The strains in Flora Bites have been carefully selected for their survivability and adherence to the intestinal tract. The chewable cube form is an easy, fun way for children to achieve optimal probiotic support and a tasty alternative to a capsule or powdered probiotic.